?Am I liable for any damages if I was forced to act quickly? ?What are my responsibilities if I injure or kill someone in an accident? ?What are my responsibilities as a passenger in a car? According to the 2016 South Carolina Traffic Collision Fact Book presented by the SC Department of Public Safety, traffic accidents have been on the rise since 2012. The number of traffic fatalities increased by 4.2% from 2015 to 2016 alone. Those numbers go from 979 traffic deaths in 2015 to 1,020 traffic deaths in 2016. Because of so many highway deaths, the South Carolina Highway Patrol began a Target Zero campaign that aims to reduce traffic deaths to zero a year. Even one death in a family is too many and the organization is working to reduce accidents and fatalities. In 2016 for instance, there were a total of 61,899 reported traffic injuries. That number was up 5.6% from the year prior. It was also noted that male drivers accounted for 69.8% of drivers in fatal crashes. 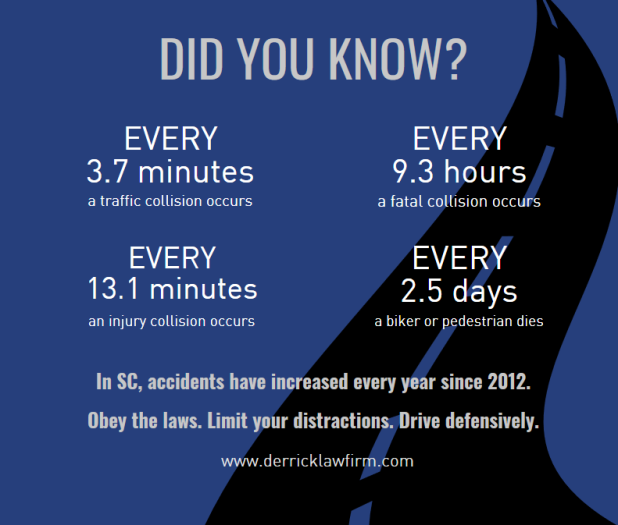 The amount of accidents, injuries, and deaths on South Carolina highways is unnecessary. Always obey the laws, limit your distractions, and drive defensively. If you or a loved one are involved in a serious car accident due to the recklessness of another, you may need an experienced personal injury attorney to get you the benefits you need. Contact The Derrick Law Firm for a free case review at 843-248-7486. Voted Best Attorney by the readers of the Horry Independent and the Myrtle Beach Herald as well as Best Law Firm, the staff at The Derrick Law Firm work to get you a fair settlement and treat you like family along the way.